Rt. Hon Frank Field DL MP, former Chairman, the Cathedrals Fabric Commission for England. I’m an architectural historian and senior heritage manager specialising in historic churches. present and produce on heritage for television. Formerly Director of cathedrals and church buildings at the Church of England, a Director at Sotheby’s with City and finance experience, studied history and history of art at Cambridge and was awarded an OBE for services to heritage in the New Year’s Honours 2017. See LinkedIn for more biographical information. You can contact me by email: janet_gough@btinternet.com or phone: +44 (0) 7967 581517 or via the form below which I check daily. 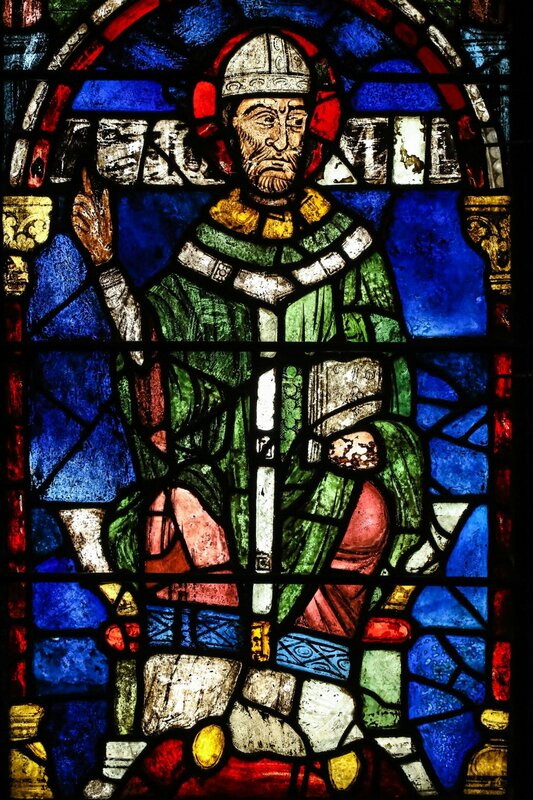 This stained glass portrait of St Thomas Becket from Canterbury cathedral isn’t quite all it seems. Can you spot the tell tales? I give illustrated talks on church heritage to many different audiences and I’m an accredited Lecturer on the Directory of Lecturers of the Arts Society (formerly NADFAS). I recently spoke at the celebrations of the 30th anniversary of the Yorkshire Historic Churches Trust at Bishopthorpe Palace, gave the annual lecture to the Friends of St Paul's Cathedral at Stationers’ Hall and the 2017 Ecclesiological Society annual Dykes Bower Memorial Lecture at the Art Workers' Guild. I can be commissioned to deliver bespoke talks and tours on subjects relating to church buildings and their history, sustainability, future use and funding. A ravishingly illustrated virtual tour of the Church of England’s magnificent 42 cathedrals, jewels in the crown of our built heritage, some recognised as World Heritage Sites. Audiences will be treated to an overview of cathedral history and architectural evolution including their surprising stories and extraordinary treasures. The changing role of cathedrals in society both in the past and present day is also discussed. I’ve chosen my favourite church from every Church of England diocese to illustrate the incredible history and architecture of church buildings bound up with the story of England over the last 1400 years. I share with the audience what can be found visiting churches and how they might enhance their own appreciation of different churches. And I discuss the many joys and challenges of maintaining this extraordinary ecclesiastical heritage today. Medieval cloisters, originally spaces linking monastic buildings, are miraculous survivors of Henry VIII’s Dissolution of the Monasteries. English cathedral communities recognised the practicality of cloisters and experimented with cutting edge architecture to build, improve and embellish them. The result is that England’s cathedral cloisters are some of the most extraordinarily beautiful spaces in the world. This talk explores the 15 or so cathedral medieval cloisters in England with spectacular photos and encourages audiences to venture beyond the nave when they next visit a cathedral. I am working with Australian production company Off the Rails on a seven part series commissioned by PBS USA on the Secrets of Britain’s Great Cathedrals, which is due to air early 2019. You can preview the series on Vimeo or via the video opposite. Off the Rails is now working on a new TV series on cathedrals and one on the Pilgrim’s Way about pilgrimage in the Middle Ages and today’s pilgrimage renaissance in the UK. I advise on campaigning, fundraising, conservation and development. I consult to churches and cathedrals on project management, options appraisals, conservation and fundraising. For eight years I was Secretary to the Church Buildings Council and the Cathedral Fabric Commission for England. I led a team which secured £40 million in new money for repairs under the First World War Centenary Cathedral Fabric Repair Fund and a total of £55 million for the Church Roofs Fund. Working with others in telecommunications and transport we achieved a private member’s bill, the Scrap Metal Dealers Act 2013 to curb metal theft and I oversaw church chair and parish church art competitions to raise design standards. As a Governor of Haileybury I’ve commissioned a conversation management plan from Cambridge Architectural Research and as a Trustee of the Priory of St John I’m involved in a lighting project in the crypt of the 12th-century church in Clerkenwell.